Anonymous website browsing means it’s harder to track key word searches. This article will show you how to find what keywords visitors search to find your site and the removes impact of the “Not Provided” keyword results in Google Analytics. This workaround will import results from Google Webmaster Tools to Google Analytics. 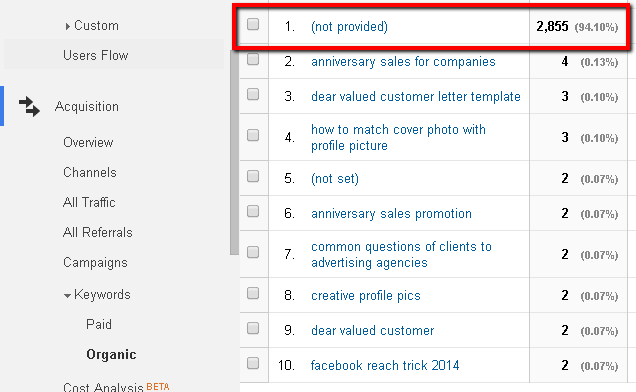 Inside your Google Analytics you can see which search terms prospects are using to find your website. 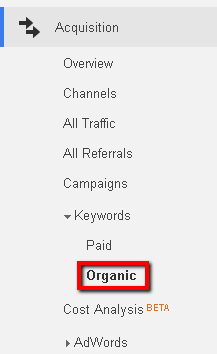 Acquisition -> Keywords -> Organic. However with the rise of anonymous browsing, this means that Google Analytics can no longer track keyword searches as easily and so an increasing number of searches are now being displayed as “(Not provided)”. This situation is getting worse month by month as we track the analytics for our website and those of our clients. Although not a perfect replacement, Creative Agency Secrets has found a work-around which can give you a good indication of what search words and phrases your website is showing up for and which are drawing visitors. It involves Google Webmaster Tools. You have to set this up for your website. Set up and Verify yourself and your website in Webmaster Tools – generally the easiest way is to do this with your analytics account. Remember your site must be using the asynchronous tracking code. Select the Google Analytics radio button (which can be found under the “Alternate methods” tab) and click Verify. Now navigate to Search Traffic in the sidebar menu. Scroll down below the graph you will see a list of Queries used and the Impressions. The main benefit of this data is you can see the Average Position your site has in search listings for each one (far right column). We are going to show you how to send this data to your Google Analytics account but it’s worth noting that there is more accuracy in this screen as Google Analytics rounds the numbers. Open Google Analytics and browse to your website dashboard. In the side menu go to Search Engine Optimization -> Queries. You will get a message advising you to enable Webmaster Tools. 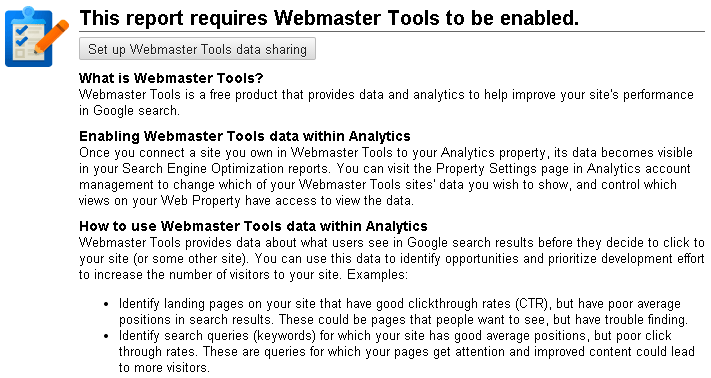 Click the button to Set up Webmaster Tools Data sharing at the top of the page. Leave all the settings it displays as default although you can change the fields if some are incorrect e.g. Industry Category. At the bottom of the page the sub-heading Webmaster Tools Settings click the Edit hyperlink. This will bring up a list of site(s) and associated Analytics web properties. Choose your site on the left radio button and Save. Click OK to Add association in the next window. On the Admin screen click Reporting in the top menu to return to Google Analytics and go to Acquisition -> Search Engine Optimization -> Queries. 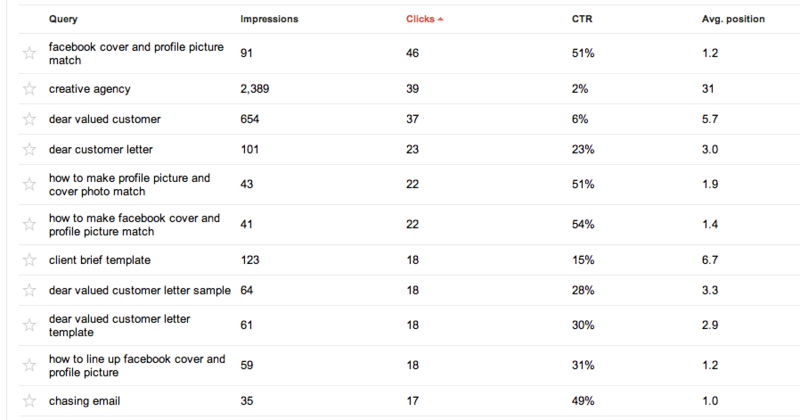 You should now see a summary graph and below it the list of keyword queries , impressions, clicks and average position of your website. For everyday checking, we find the Google Analytics summary data is fine. But for non-rounded data, go into the Webmaster Tools display to get the full picture. *Note that data is normally 2 days behind on these searches compared to other metrics in Google Analytics.